There are certain images to which one is an eyewitness — images seen through one’s own eyes or through the miracle of television — that are seared into one’s memory forever. Of course, 9-11, President Kennedy’s assassination, the Challenger space shuttle disaster, “shock-and-awe,” rank high among them. 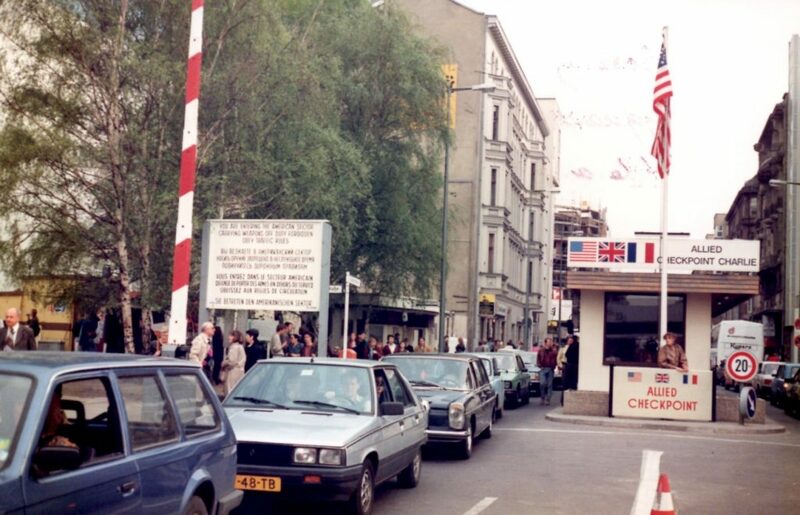 I was living and working in Brussels, Belgium, at the time and watched, via live TV, history being made. It was the history that President Kennedy did not live to see after he visited Berlin in June of 1963, almost two years after the infamous “Berlin Wall” wall was erected, when he clearly condemned Soviet policies in the divided city with his “Ich bin ein Berliner” speech on the steps of Rathaus Schöneberg. 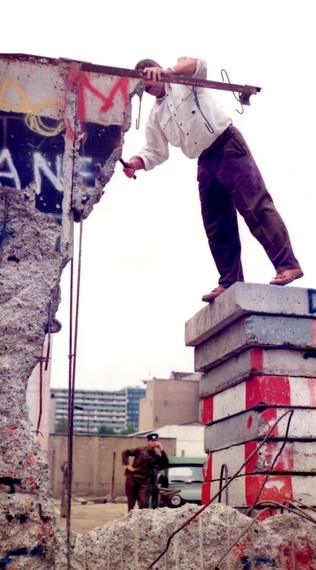 The Wall did not physically come down during that long night 29 years ago. It would take several more weeks and months for the massive, reinforced concrete wall to be chipped, pickaxed and, eventually, bulldozed down. However, it soon became clear that, symbolically, the wall of oppression, fear and death had already fallen — forevermore. Scenes of incredible confusion, chaos and potential violence unfolded minute by minute on our TV screen. Thousands of East Germans converged on checkpoints between East and West Berlin demanding unrestricted passage to West Berlin. As the pressure, the tensions and the crowds became overwhelming, guards at some checkpoints let some people enter West Berlin. At other crossings, the guards simply raised their hands and the barriers, allowing tens of thousands of jubilant East Germans to cross into West Berlin and into the arms of thousands of equally jubilant West Berliners who had expectantly gathered — most with tears in their eyes and many with bottles of champagne and flowers in their hands. Many searched anxiously for loved ones they had not seen in years, and the world witnessed numerous emotional scenes of joyful reunions. Close to midnight, most of the other crossing points inside Berlin were opened and thousands upon thousands of East Berliners poured into West Berlin on foot, on bicycles and in packed cars, some carrying a few meager belongings. I do not remember any shots being fired. 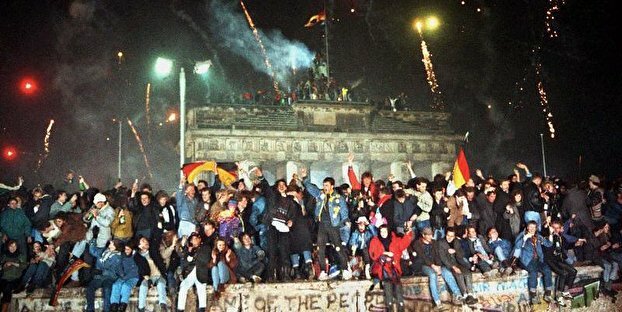 But I do remember, during the early hours of chaos, East German guards menacingly pointing weapons at demonstrators and dousing some who scaled the wall with fire hoses. But even the ice-cold water could not dampen the spirits. Germans were deliriously happy. Festivities went on for days. Any pretense of controlling the flow of East Berliners into West Berlin was soon abandoned and all border crossings were opened. 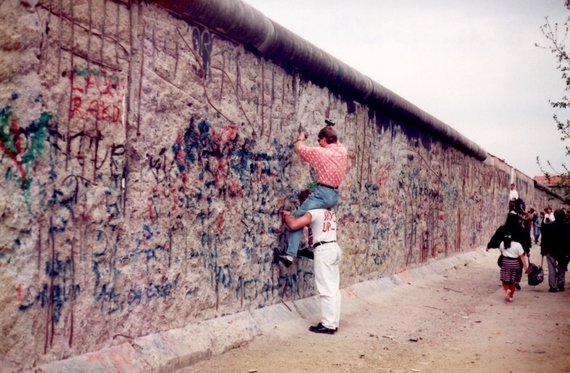 The entire 20-mile-long wall that ran through the middle of Berlin came down by the end of 1990 — a monstrosity, complete with anti-vehicle trenches, guard towers and mined “death strips” that resulted in the deaths of almost 200 people who were only seeking freedom. That wall could not keep another 5,000 from escaping tyranny by climbing over or crawling under it through hand-dug tunnels. Within weeks, people were allowed to travel by train between Western Europe and Berlin, albeit still only at night. I was one of those first travelers. When I arrived at the wall, I saw hundreds of people hacking away at large sections of remaining wall. 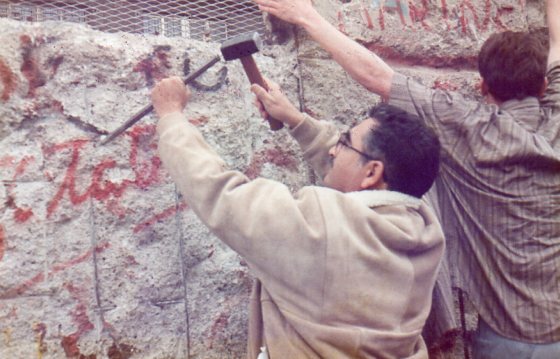 I realized that the spirit of free enterprise had arrived when I saw a number of young men renting hammers and chisels to tourists to chip at the wall. I promptly rented a set. During the many years of its existence, West Berliners had generously decorated the wall with lots of colorful and imaginative graffiti. Pieces of the wall with such graffiti were the most coveted. However, when I arrived at the Wall, most of the original graffiti had been hacked away. Not to worry. By morning — thanks to overnight spray-paint-can technology and German ingenuity — the graffiti miraculously reappeared. We all knew we were being had. But in the euphoria, no one seemed to mind. I still proudly display pieces that I chipped from the Berlin Wall, some with fake graffiti. But there is nothing fake about the history I witnessed being made 29 years ago. Versions of this story have appeared previously in the Austin American-Statesman,the Stars and Stripes, The Huffington Post and The Moderate Voice.